In addition to enacting the six-strikes law, many USA internet providers have made it difficult to access and download torrents from popular torrent websites. This includes companies like Time Warner Cable, Comcast Xfinity, AT&T, Verizon Fios and Charter Communications. These (and other) ISP's may actively monitor your internet activity, even beyond the extend required by law. Most use a technique called 'Deep Packet Inspection' which allows them to see the actual content of your transferred data, and even to selectively log, throttle or block that traffic. Torrent/p2p packets are among the most commonly blocked. And some ISP's (such as Comcast) are trying to actively Block all torrent uploads. Comcast doesn't publicly share their data retention policy, however an internal handbook leaked online which states that they keep a historical record of subscriber IP addresses for 6 months (page 10). We didn't find a specific reference to whether they do or don't ever log historical website visits (it would be quite easy to do). Also, there's evidence that most ISPs have some level of cooperation with national intelligence agencies (such as the NSA) so this information may well be shared without directly residing on Comcast's servers. Comcast performs DPI (Deep Packet Inspection) and data travelling through their network. They use Sandvine (a DPI technology) to disrupt and terminate p2p sessions and peer connections. Torrentfreak believes they specifically target the Bittorrent protocol and many Comcast subscribers have reported that upstream bandwidth is essentially blocked and downloads are slow when torrenting. The Fix: Use a non-logging VPN like Private Internet Access to encrypt your torrent traffic and prevent DPI analysis. Time Warner is one of the most forthcoming internet providers in the USA regarding their data logging policies. Their website has a subpoena compliance page and legal request guidelines. These pages shed light on exactly what information Time Warner records about your online activity. We couldn't find any statements regarding DNS logging (which would expose your web browsing history). However it's clear that Time Warner keeps IP Address Logs for at least 6 months (showing which IP address(es) have been assigned to your account). As a result, any IP address monitored in a torrent swarm can easily be traced back to that TWC subscriber, unless you take steps to hide your IP address while torrenting. While some users have questioned if Time Warner is throttling torrents, there isn't overwhelming evidence that there are. TWC certainly doesn't block torrents, and they are still accessible. As a former TWC subscriber, I was able to max-out a 15mbps connection while downloading torrents. I did notice throttling on streaming video such as Youtube/Netflix but it didn't appear to affect Torrents. Time Warner doesn't officially ban bittorrent activity, however they do require you to download legal torrents, and obey copyright law. They do comply with DMCA laws and were participants in the Six-Strikes copyright agreement that now is reportedly dead. Recommendation: Use Private Internet Access to encrypt your torrent traffic and prevent monitoring by Time Warner. This will also mask your IP address in torrent swarms. We have setup guides for uTorrent, Vuze, Deluge, QBittorrent, and Android. AT&T is relatively opaque regarding their data retention policies. They never responded to TorrentFreak's ISP data retention questionnaire (despite multiple contacts). This document posted by the ACLU suggests that AT&T keeps IP address records for 1 year. On a positive note, the document classifies historical web browsing records and download history as 'Not Available'. So they may not directly monitor and log your DNS requests. Don't get too excited however. There is alot of anecdotal evidence to suggest that AT&T's infrastructure has deep ties to the NSA spy agency, especially in a major NYC building which is also an international data hub. This amazing expose from The Intercept sheds provides a fascinating look at potential collaboration. Of course the NSA isn't technically​ allowed to spy on US citizens. AT&T doesn't block or ban torrenting on their mobile or broadband networks. However, they are proactive about disconnecting accounts that download illegal files repeatedly. It seems that unlike Comcast they did a good job of complying with the six-strikes legislation (which we applaud). 'Fast lane' patent that also had implications regarding torrents. The stated goal was to internally seed torrents on AT&T's own network in order maximize efficiency and save bandwidth. Of course, the existence of a 'Fast Lane' also implies that there's a 'Slow Lane'. That sounds alot like throttling. Monitoring: The same patent also explicitly relies on the ability of AT&T to 'Monitor' P2P and torrent downloads on their network. This is something that all ISPs have the ability to do (unless you encrypt). But most internet providers choose not to actively monitor filesharers, other than DPI analysis for bandwidth shaping. CenturyLink's Data Retention Policy details exactly what information they store, but not how long they keep it for. It sounds like the retention period could be user-dependent, ranging from "days" to indefinitely. Furthermore, it appears that in some circumstances, Centurylink may monitor/log the actual content of your internet activity, such as files downloaded and websites visited. This is more invasive than most ISPs. Solution: By using a high-quality VPN service with strong encryption (and no DNS leaks) you can make it impossible for Century link to log or monitor your online activity. We recommend Private Internet Access. (read our full review). Centurylink doesn't explicitly ban peer-to-peer filesharing or Bittorrent on their network. However they may utilize bandwidth shaping technology to 'Throttle' some torrent traffic. Also, they're unfortunately one of the VPNs that forwards settlement demand 'Extortion Letters' to users that allegedly downloaded copy-protected content. And since Centurylink does log your historical IP address assignments, your torrent activity is directly traceable by your torrent IP address unless you take steps to hide it. Having had personal experience with Fios, we have had an overwhelmingly positive experience with them as an ISP. They are advocates of net neutrality and don't appear to engage in torrent throttling. Unfortunately, Verizon has one of the longest data retention periods of any USA-based ISP. As of 2012, IP address assignments were kept for at least 18 months (1.5 years). It's not clear whether Verizon monitors/logs your web browsing history. They do however force the use of Verizon DNS servers (unless you specify your own) which makes it extremely easy for them to monitor the websites you visit. Most corporate DNS servers (like Verizon's) will keep some sort of logs, likely including the DNS record and the requesting IP address. 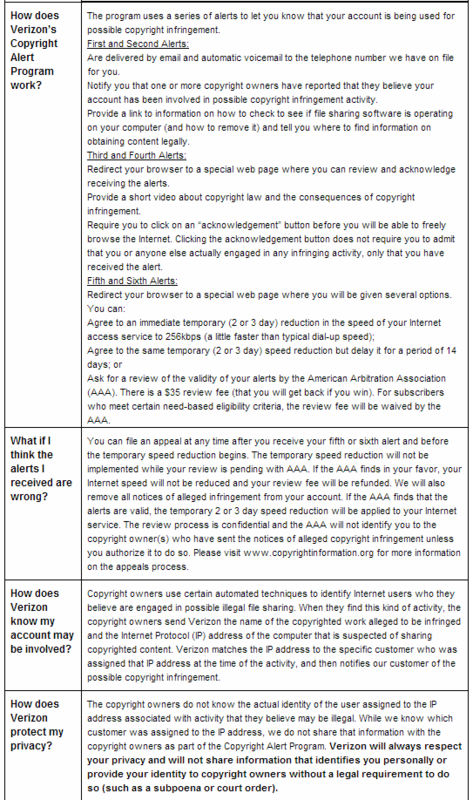 Verizon does allow torrenting but they are also participants in the (now defunct) six-strikes copyright alert system. As a result, users are expected to act responsibly and download legal torrent files. A leaked document shows Fios's escalating response to repeated 'six-strikes' violations, which get progressively harsher up to the 5th & 6th alerts which will reduce speeds to 256kbps (basically dial-up speeds). They do seem to stop short of cutting off internet access altogether, though that may have changed after the DMCA safe-harbor revocation against Comcast. So HOw can you keep your ISP from monitoring your Torrents? Your internet provider is only able to monitor your web history and torrent downloads because they have full access to your data stream. All traffic flows through their servers before reaching the rest of the internet. But what if you could encrypt all your data before it goes to your ISP? Then they wouldn't be able to block, monitor, or throttle anything. Your web browsing history would be private, and they wouldn't know what torrents you're downloading (or whether you're using p2p/bittorrent at all). That's why we recommend all USA-based filesharers use a high quality torrent Virtual Private Network service (VPN) to mask your torrent IP address and encrypt your entire internet connection. Anonymous - Access to 100's or 1000's of IP addresses to mask your real IP in torrent swarms. Easiest option: We usually recommend people try Private Internet Access as their first VPN. They're cheaper than basically everyone else (for unlimited plans) and are one of the world's most torrent-friendly VPN companies. If you have an ultra-high bandwidth connection (100Mbps+) then go with IPVanish. These companies are all true zero-log VPN services, meaning there is no record of your IP address history or file transfers via the VPN servers. This dramatically increases your torrent privacy. You should NEVER choose a logging VPN service if your primary usage is Bittorrent. Private Internet Access is one of the first VPN companies to embrace file-sharing, and choose to never log their users. They also include a Socks5 proxy service for free with all Unlimited VPN plans. You can use the proxy inside your favorite torrent client for added anonymity/separation. Read our full review of Private Internet Access. IPVanish is also now a true logless VPN (they adopted a zero-log policy in 2014). Feature-wise, IPVanish is almost identical to PIA. They have software for all major platforms (desktop/mobile) and all plans include a Socks5 proxy. At $6.49/month, IPVanish is a pricier option than PIA. But there's a good reason: IPVanish is insanely fast, and they have access to one of the largest data backbones in the USA. This is why IPVanish tops our list of the fastest torrent-friendly VPNs. More Info: Read our IPvanish review for a full overview as well as setup instructions for their Socks5 proxy (in uTorrent, Vuze, etc). Want to know how to setup your VPN with your favorite torrent client? We've got it. Need VPN reviews and comparisons? We've got that too. Happy torrenting! Is Cyberghost good for torrents?